Hi friends! I hope you are having a great weekend! Have you entered ALL the fabulous giveaways I'm having? I have 9 that I previously posted so be sure to check them out! 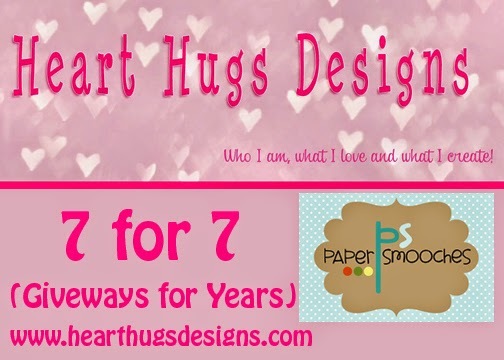 Today, I have a giveaway from Paper Smooches. Kim so sweetly offered up 1 stamp set of the winner's choice as the prize. I know I have a wish list a mile long from Paper Smooches. There stamps are the CUTEST! They are awesome quality and the designs are fabulous! I also have their dies and they are amazing as well. I made a card to go along with this giveaway since I'm so thankful for my readers and all my sweet friends who offered up awesome giveaways to help me celebrate 7 years of blogging. I played along with the sketch on this week's Paper Smooches Sparks. I just needed a ton of this little hamster on a card so this is what I came up with. Not sure that it works but I'm going with it. The hamster and warm & fuzzy is from Party Posse and the thanks is from Pretty Phrases. The paper is Basic Grey. What an adoarable card! I love the colors. I love that little hamster, this is so cute and I'm a huge PS fan! My favorite occasion is probably Birthdays! I would say Christmas but I get tired of the same design. Ashley- that hamster background is the cutest! Seriously adorable! Congratulations on your blog anniversary and thank you for sharing your card with the Paper Smooches SPARKS challenge. I love making thank you cards. So...I guess my favorite 'occasion' is when I get something! HAHAHAHA! Too cute! Love how you stamped the hamster background. Thanks for joining us at Paper Smooches SPARKS! Such a fun card! I love making holiday cards! My favorite time to create special cards! Love PS delightful stamps and dies! Love your card! Such cute stuff!